Genre . . . How do I choose only two? In your submission letter, you are asked what genre your book is. Recently, Diva Jen wrote a wonderful blog post on this subject. It may be difficult, but you need to only list the first two that pertain to your manuscript. You need to be as specific as you can. To help you out, many genres are combined: Contemporary Romance; Historical Romance, Teens & Young Adult, etc. That way you can actually sneak in three or four genres. While a publishing house only wants you to list two in the bullet points, you can mention in your letter that your story touches on others. My book, Outlaw Sheriff, is a historical romance and an adventure. There are also elements of mystery and drama. When readers leave reviews at places like Amazon, they can tag your book with whatever genre is foremost in their minds. That will bring more readers to your book. At my blog, First Page to the Last, I tend to label the book I’m reviewing with every genre that I think applies. I want a reader who likes Ghosts to be able to just click on that link and find all the ghost books that I’ve reviewed. Some of the books have at least eight! For every main genre, there are myriad sub-genres. Check out this page at Goodreads. 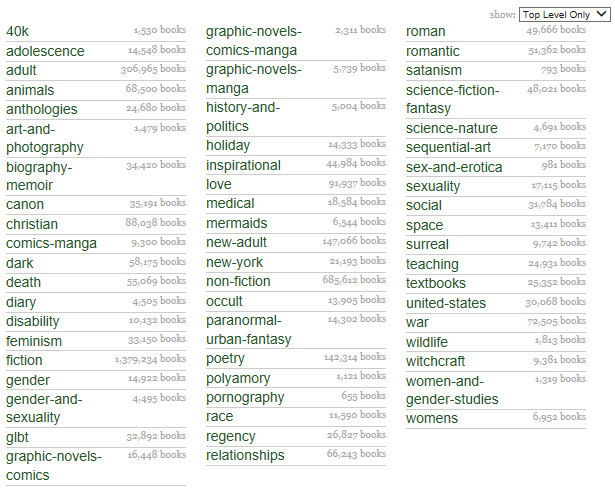 It lists the top shelf genres, over a thousand of them. Choose the two genres that best describe your book. Write Divas can help you narrow the choice down to the two that fit your manuscript the best.